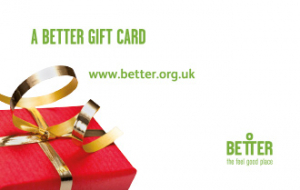 Better has an extensive network of over 250 leisure centres across London, the South East, Swindon, Manchester, BANES, Carlisle and Belfast. We can help you reach your goals and give you the opportunity to workout close to home, work, or to meet up with friends, whether they use your local centre or one local to them. There is something for everyone at your local Better Leisure Centre. From tots to teenagers, young adults to the older generation, we have something to offer which everyone will enjoy. You can choose from a wide range of activities and sport, including: Gym, fitness classes, swimming pool, sport halls, squash, badminton courts, athletic tracks, crèche, spa, lessons and courses, adventure playgrounds. Facilities vary by centre, but you are bound to find an activity you enjoy which helps you meet your goals. Exclusions: Better Gift Cards are not redeemable on spa treatments at Porchester Spa. Gift cards can be activated with a minimum value of £10. E Vouchers need to be printed out and presented at our centres. E Vouchers cannot be topped up and re-used. The full value of the transaction cost is deducted at point of sale. Any credit remaining on a card will expire 12 months following the last active card use. Gift cards should be treated as cash. Better will not accept liability for lost, stolen or damaged cards. Better reserves the right to amend these terms and conditions at any time or withdraw the card with reasonable notice. The value on a gift card cannot be refunded or exchanged, except where a fully unused online gift card is cancelled during the Cooling Off Period. Cooling Off Period Means 14 calendar days from the date and time you purchase any goods or services from us online. The balance on a gift card is not covered by the Financial Services Compensation scheme so in the unlikely event of Better becoming insolvent the value left may not be available to spend.